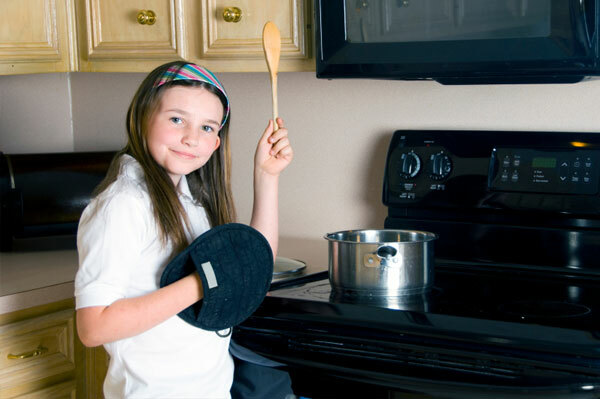 From very early ages, helping in the kitchen isn’t just for fun, it helps develop motor skills and can introduce vocabulary and math concepts to kids. That it’s tasty, too, is an awesome bonus. I love that the kids like to help me in the kitchen. Whether it’s breakfast, dinner, or cookies – and especially cookies – I’ve tried to share my enjoyment of cooking with the kids. And given their desire to try new things on their own, I looks like I’ve succeeded. A good thing, yes, but also a scary thing. It also means they want to use everything in the kitchen on their own. Even the hot things, and the sharp things. I’m ready for any of them to have free run of things. all feel comfortable with developing skills and understanding, freedom in the kitchen for the kids will happen – and I know it will happen. mitts that will protect arms as well as hands, and a review of how to set the temperature on the oven. Given the frequency with which we now have fresh cookies in the house, this has gone well. While I still prefer they not try to broil things, baking has gone just fine. can get that down more fluidly that we’ll let him use kitchen knives for chopping. My 5-year-old daughter, of course, goes no where near knives. knives are good for which tasks. But, still, it’s knives that make me the most nervous. My oldest is the only one really using knives so far, and so far, so good. Phew. a little bit at a time (and the results will be delicious).